As we head into a weekend with nothing but rain on the docket, it’s easy for my mind to wander to soups, stews and braises. Something that will keep the oven on all afternoon and produce a dish that is warm, comforting and filling. It is easy for my mind to wander there, but I’m not letting it. I’m sticking with fresh, bright flavors in hopes of using my taste buds to pull myself out of this rainy weekend. 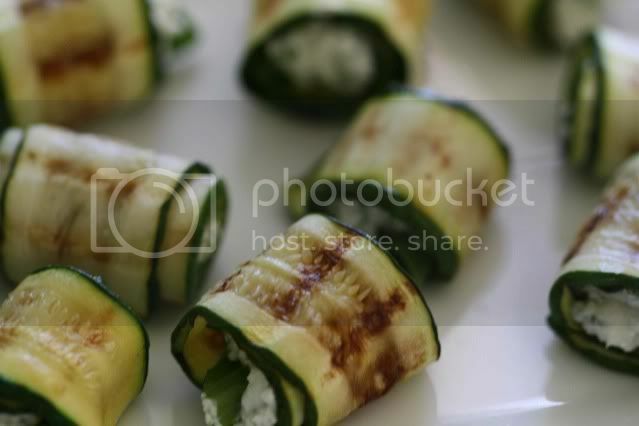 These little appetizers of grilled zucchini wrapped around fluffy fresh goat cheese, basil and citrus should be enough to remind me of warm evenings spent outdoors post-time change (even if the grill marks on the zucchini came from my grill pan and not the outdoor BBQ). The recipe comes from Ellie Krieger, but I’ve taken quite a few liberties with it including doubling the amount of goat cheese. After all, I wouldn’t want things too healthy - it is raining outside. If you want to read the original, and slightly more healthy version of the recipe, just click on her name below. If all this rain continues, that duck confit I’ve been threatening to make will definitely come to fruition, but for now I’m counting on these light fresh flavors to satisfy me. Actually, even if the rain doesn’t continue, the duck is definitely coming to fruition. Perhaps after I let my mind start to wander again. Thinly slice the zucchini on a mandolin and discard the outermost slices. Season with salt and pepper. Place a grill pan over medium heat and spray with cooking spray. 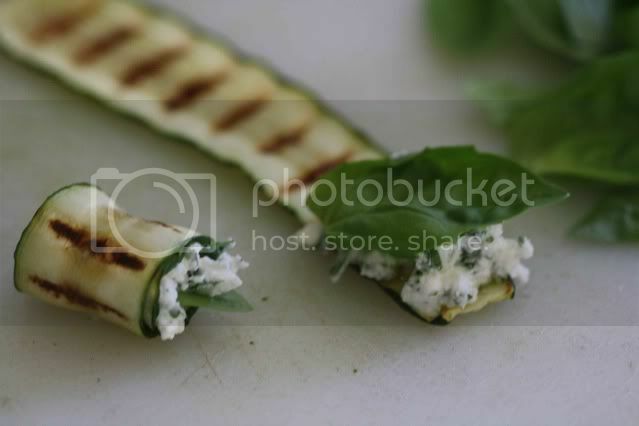 Cook the zucchini until tender and grill marks appear (about four minutes per side). In a small bowl, combine the goat cheese, parsley and lemon juice, and season with salt. Put a small spoonful of the cheese mixture on each zucchini slice and top with a basil leaf. Roll up and place seam side down on a platter. Repeat with remaining zucchini slices. Those are so cute! I love goat cheese. I can't wait for grilling season to arrive here so I can try them. Those look so fun and summery! What a perfect appetizer for a Barbecue! lemons have helped me cope with this rain we have been having.oh and this week red vegetables. these guys look great and seem pretty easy to make. thanks for the recipe. I've done these in the oven but never on a grill. I found getting the right size slices that didn't break was a big pain. But they are delicious! These look amazing and I'm loving the grill marks. I love that cookware has evolved now to where we can grill indoors in the winter months. These look so pretty and delicious. And doubling the goat cheese...a girl after my own heart. Good looking little bites that would be ideal to serve with drinks. Your gougère look so cute and dainty! Ooh, I'm glad I found *your* blog too, so pretty! Look forward to reading more and seeing more of your lovely photos. These look awesome. I can't wait to make these when I'm up to my ears in zucchini this summer! That a good ideal,I will have a try to cook.